Air Tool 1/2in Reversible Air Drill 31inc 14-326 / BOWES TT 37326. 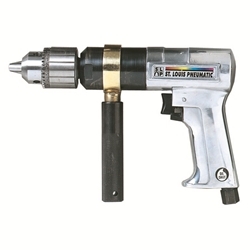 This tool adds a second reduction stage to the SLP-4238 for additional torque and power. lncludes industrial duty 1/2" drill chuck and key. Also includes auxiliary side handle.